US ambassador to Libya 'killed' Jump to media player The US ambassador to Libya has been killed in an attack on the US consulate in the city of Benghazi. Egypt protesters breach US embassy Jump to media player Protesters have breached the wall of the American embassy in Cairo and torn down a flag over a US-made film which they say is insulting to the Prophet Muhammad. 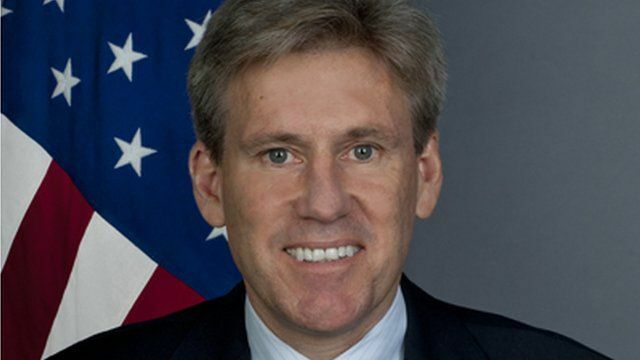 Libyan officials say the American ambassador, John Christopher Stevens, has been killed in an attack on the US consulate in the eastern city of Benghazi. Reports say he was among four people killed, although the US government has yet to confirm the details. Gunmen stormed the building as part of protests against a film about the Prophet Mohammed. Rana Jawad reports from the Libyan capital, Tripoli.